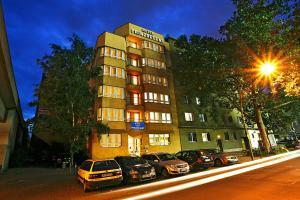 This hotel offers free parking and soundproofed rooms in the Wilmersdorf district of Berlin. It is 500 metres from the Bundesplatz underground and city rail station. The rooms at the Prinzregent by Centro Basic have been decorated with cream and bold coloured fabrics. Free WiFi is available on all floors. From Bundesplatz S-Bahn (city rail) and Underground Station, guests can reach the Kurfürstendamm Shopping Street, Berlin Trade Fair and Berlin Zoo in just a few minutes. Berlin’s A100 city motorway is a 2-minute drive away.